A man was beaten by a thug linked to Wayne and Alan 'Fatpuss' Bradley after a dispute erupted outside a house. In the footage, one man holds on to the victim to keep him steady while the experienced gangster, a pal of slain gangland boss Eamon 'The Don' Dunne, batters the man repeatedly with an iron bar. It's understood that the man who was beaten has since sent a grovelling message apologizing to the gangster. Alan 'Fatpuss' Bradley is under significant jeopardy as he is the subject of a credible threat by a thug linked to the Kinahan Group. It's thought the paranoid gangster has surrounded himself with young thugs that offer him security. 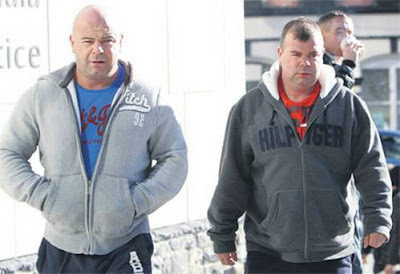 A Kinahan crew member fled Ireland in the wake of garda attention. He left his area vacant and the Bradley brothers took advantage. They and their associates are now targeted. Reports have recently claimed that Alan 'Fatpuss' Bradley has been spotted wearing disguises to avoid hitmen and is living in constant terror. The gang has secured their homes with bullet-proof glass and reinforced doors and have surrounded their properties with cameras.